Beautiful Lee Falls is located near Walhalla in Oconee County. The 75-foot waterfall has no official trail going to it, and the well-worn path made by hikers is said to be quite difficult. That said, the 1.5 hour hike is well worth the effort to see this lovely waterfall in person. The waterfall's secluded location and misty atmosphere create a perfect habitat for fabulous flora and fauna. 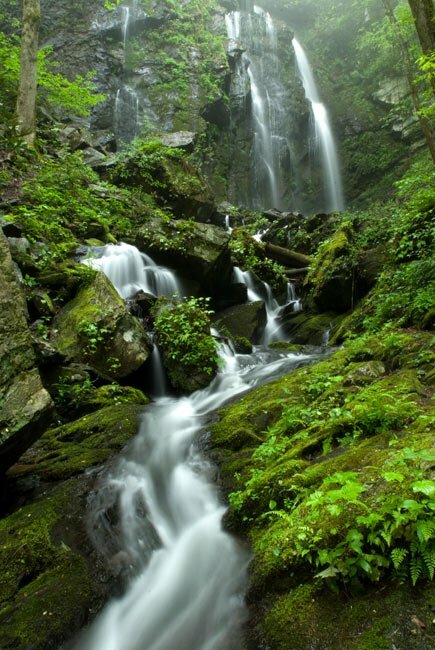 Hikers have reported seeing Oconee bells, bulblet ferns, mosses, unusual amphibians, and much more near Lee Falls. Did you know South Carolina is home to some of the Southeast's most stunning waterfalls and cascades? Our waterfalls spill over glossy granite walls, barrel past boulders, and plunge down rocky cliffs. While many visitors flock to the beach during the summertime swelter, a dive into a cool waterfall pool offers a tranquil escape from the crowds. SCIWAY thanks photographer Steven Faucette for submitting this beautiful photo in April 2011. This four-day event boasts street dances, a golf tournament, an arts and crafts sale, a beauty pageant, carnival rides, fireworks, a baseball game, and a parade. The festival is a time for the townspeople to celebrate their history and to honor the veterans and crewmen of the USS Cowpens CVL 25 and the USS Cowpens CG63. Want to see the full calendar? Just click here to check out SCIWAY's complete calendar of June SC events! Also, remember that all our event calendars, for every month of the year, are available on SCIWAY's website 24/7/365 – just go to https://www.sciway.net/calendar.html.